I always have good intentions—to make a dish specifically for a holiday post—and posting it ahead of time or the day of. Sometimes, I have been known to make something for our actual holidays and then schedule it to post next year at the appropriate time. I could do that with this recipe but it would be such a waste. 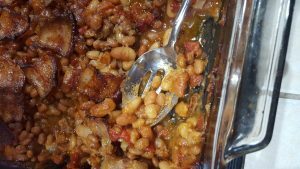 These are the BEST baked beans ever and while they require an extra step, it’s not much of an effort and it is well worth it! Preheat oven to 350 F. Whisk barbecue sauce, ketchup, water, mustard, vinegar, liquid smoke, granulated garlic, and cayenne together in large bowl; set aside. Cook bratwurst in skillet over medium-high heat, breaking up into small pieces with spoon, until fat begins to render, about 5 minutes. Stir in onions and cook until sausage and onions are well browned, about 15 minutes. Transfer bratwurst mixture to bowl with sauce. Stir in baked beans, pinto beans, cannellini beans, and Rotel. Transfer bean mixture to 13×9-inch baking pan and place pan on rimmed baking sheet. Arrange bacon pieces in single layer over top of beans. 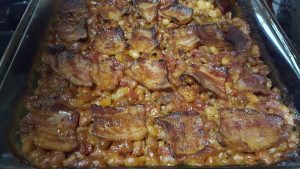 Bake until beans are bubbling and bacon is rendered, about 1½ hours. Let cool for 15 minutes. Serve. My old stand-by recipe can be found here. It was good but IT HAS BEEN REPLACED. Fourth of July Baked Beans is a great side but honestly could be a meal in itself. 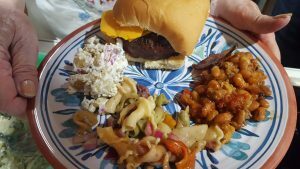 Sorry ’bout the photos but we were dishing it out and eating pre fireworks. As you say, there’s no reason why a good dish of baked beans needs to be limited to the 4th of July!